Yale makes numerous IC or Internal Combustion lift trucks as part of their fleet. These lift trucks are designed according to their particular specifications so that these machines could perform numerous tasks in a huge range of industries. These lift trucks utilize Yale in-line, 4 cylinder Mazda engines, either 2.0 or 2.2L units and GM engines in 4.3L and 2.4L capacities. These kinds of engines are extremely durable, efficient and really powerful. They have been proven for both performance and reliability. Yale Hi-Vis Masts offer innovative engineering and design. These masts have earned a solid reputation for being very well built and providing unsurpassed visibility. All components are manufactured to provide low-maintenance, longlife capabilities and excellent performance. The pneumatic I.C.E. Forklifts produced by Yale are manufactured and designed to function in some of the harshest terrain and most demanding businesses. For instance, the Yale GP-VX Series features rugged 6 cylinder and 4 cylinder Yanmar, Mazda, Cummins and GM engines, available in gasoline, diesel and LPG units. These particular engines are application proven for providing awesome dependability and overall performance. Another excellent product is Yale Techtronix electronically controlled transmissions offer exceptional durability and performance. Yale Hi-Vis mast incorporates superior visibility, solid construction and innovative design and engineering. All parts are manufactured to offer excellent performance while providing low-maintenance, extended life. During a shift, both the reach assembly and the carriage parts on a narrow aisle truck undergo a tremendous amount of stress. The high durability of these parts is totally necessary in order to assure that the truck maintains high production levels. Yale reach mechanisms are particularly designed utilizing heavy-duty parts so as to extend total durability and long life of the parts. For more strength, at the end of the stroke, the reach assembly is cushioned. This particular design feature helps to provide exceptional durability and maintain operator ergonomics. Superior visibility is maintained by the open carriage design which provides optimal house routing. The Reach Assembly Rear Carrier is mounted on angled load rollers in order to force durability and rigidity by resisting side to side forces. The inner frame assembly provides a stronger inner frame. This design is made to withstand vibration and shocks during handling cargo. There are numerous thick inner frame side weldments particularly constructed for more durability. 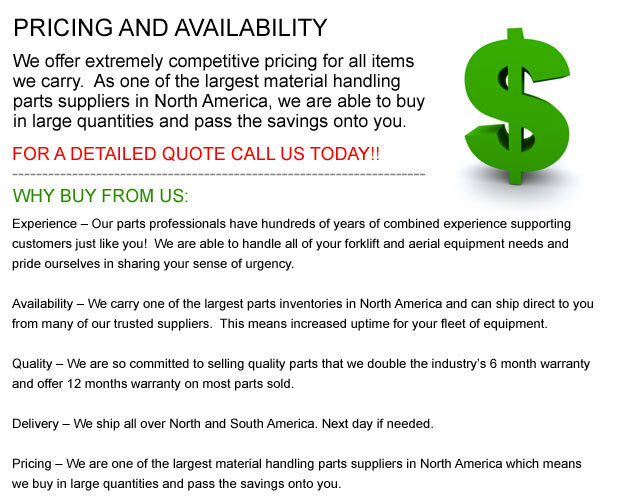 Copyright © 2010-2019 forkliftpartsohio.com All Rights Reserved.